We begin worship with our families in the sanctuary. After the Children's Sermon we move to the Lower Level for Church School. On the first Sunday of the month we stay in worship with our famil﻿ies ﻿to﻿﻿ take Communion. Professional child care is always offered in the Nursery for infants and toddlers. 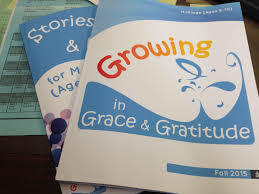 Valley's Church School is using the curriculum "Growing in Grace and Gratitude". Gathering in God’s Grace: Welcoming and preparing children to hear God’s Word. This part of the session includes singing and praying, as well as hearing and reflecting on the week’s Bible story. Responding in Gratitude: Highlights ways we pray, claim, celebrate, and offer God’s grace to others. Loving and Serving God: This sending extends an invitation to discipleship that inspires children and their families to practice hospitality, generosity, and love. We have three Sunday Class groups this year. BLAST: Believing, Learning, and Sharing Together This group is for seventh-twelve grade. They use a "Faith Questions" which is based on questions posed by older youth from around the Presbyterian Church.